Through bar mitzvah contributions and with the help of his parents’ donation and his own contribution, Sam met his goal, raising enough money to enable Deborah Vita and her family to move back home. In addition, on the weekend of June 18, Sam, his entire family and their friends the Linskys flew to New Orleans to work on the Vita home, with my father as well. Afterward, I interviewed Sam about the project. In January, you had your bar mitzvah ceremony, which celebrates your coming of age in the Jewish religion and you undertook a mitzvah project. What is a mitzvah project? A mitzvah project is a charitable project for a worthy cause that means something to you. I picked the St. Bernard Project because I love New Orleans, and it meant something to me. What made you choose the St. Bernard Project? On my vacation [in 2008], we went down to look at St. Bernard Parish to see what had happened there. We also visited the 9th Ward and saw the houses that Brad Pitt built through the Make It Right Foundation [makeitrightnola.org]. We contacted [Make It Right and the St. Bernard Project], and the St. Bernard Project got back to us quickly. They were so organized about everything. We found out more about Liz McCartney and Zack Rosenburg [who both founded and run the organization], and how Liz won the CNN Hero of the Year Award [in 2008]. They were just great, and we wound up working with them. How did you go about collecting the money? I wrote a letter to everyone we invited to the bar mitzvah and asked them to donate something to the St. Bernard Project. I told them what the organization was and how much their donations would help. For example, $10 would pay for a box of nails, and so on. Some people sent $5, some sent $500. These people donated a good part of the money, and my mom and dad made up the difference. You donated some money too, right? I donated about a third of the money people gave to me for my bar mitzvah to the project. In mid-June, your family spent two full days working on the house you helped rebuild. Can you tell me about your trip? The morning after we flew in, we woke up and headed to the St. Bernard Project’s offices. It was amazing. I was so impressed. They were so organized. [During orientation] they showed us how well they were doing. They told us stories about what happened, about some of the people they worked with. I realized how amazing these people were, the people at St. Bernard Project and the volunteers. They really care. There is no better source of help than the human heart. If you think about it, the government took so long to even send the trailers so people could have places to live. But there were volunteers who came the very next week to help. After the orientation what did you do? After the office, we went to the house and started building. I met the family and their dog, Hank. They were really nice. They’ve been out of their house for five years, and I felt really good about helping them get back there again. We did mudding, sanding and some exterior work. Someone had spray-painted [profanity] on the wall. We tried and failed to get it off. You were inspired to do this project partly because of your connection to New Orleans. I love New Orleans. You, my mom and [his other sister] Robyn are from there. Mom Mom and Pop Pop [his grandparents] live there. I also love that the people are so friendly. And you know how much of a Saints fan I am. I love the Hornets, I love the food—don’t get me started, the food’s amazing! Oyster po-boys, everything. I love the music. The city’s so lively, and it’s had such a huge effect on me. 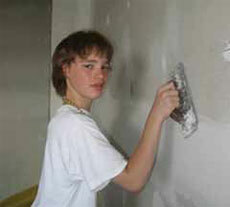 Do you have any plans to do more community work in New Orleans? I feel like I’ve done a good thing and I’m happy about that. I don’t have anything specific planned for the future, but I’d definitely like to help.